United Farm Workers Monument, Riverside, CA. Source: Sean Kheraj, 2018. For several years now, I have been fascinated with the ways in which the internet can enhance and transform academic conferences. We have seen conference organizers make better use of websites, web applications, and mobile applications. We have witnessed the promises and perils of conference Tweeting. We have even seen entire conferences held on Twitter. NiCHE itself has been at the forefront of several online projects that experimented with different ways of using the internet to disseminate conference proceedings to audiences beyond the conference halls. For about 10 years now, NiCHE has been digitally recording and publishing conference presentations. You can find more than 150 in our conference and workshop archive here. 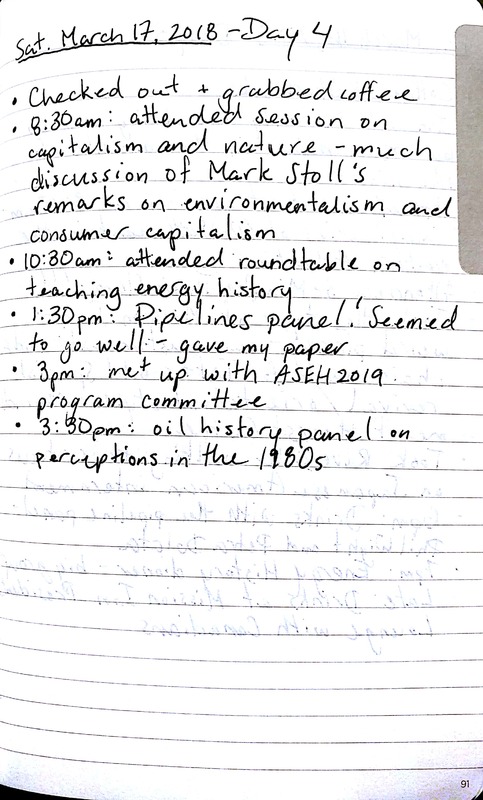 In 2015, I posted daily recap videos from the American Society for Environmental History annual meeting in Washington, D.C. so that viewers who were unable to attend could get a sense of some of the main themes to emerge from the conference. This year, our social media editor, Jessica DeWitt, organized a pre-ASEH Twitter conference (#ASEH2018Tweets) for those unable to attend the conference in Riverside. A Pen. For writing notes and brilliant thoughts. Moleskine Voyageur notebook. For storing notes and brilliant thoughts. Also for storing printed copies of my conference paper and the conference program, a map of the Riverside area, and all travel details (flights, shuttles, hotel). USB drive. For storing a digital backup of my conference paper and my PowerPoint presentation. iPod Shuffle (ca. 2007). For listening to podcasts while sitting around at airports. Digital camera with no Wi-Fi capabilities. For taking beautiful pictures on field trips. I basically traveled like it was 2007. The experience was intriguing and, at times, unsettling. I’m embarrassed to admit that leaving home without a phone sparked a small bit of anxiety that soon subsided. My efforts to remain entirely disconnected were thwarted, however, when I arrived and discovered a problem with long-distance telephone calls in my hotel room. I wasn’t able to call home. Quickly, I dashed across the street to the local pharmacy to purchase a long-distance calling card only to discover those no longer exist (it isn’t, in fact, 2007). Instead, I had to purchase a low-cost mobile phone (aka. a “burner”) for $30. I could call home and text once again. In spite of this minor setback in my plan, I remained offline for the conference. I did not Tweet. I did not share photos. I did not publish blog posts. I attended panels, roundtables, and workshops. And I took notes. 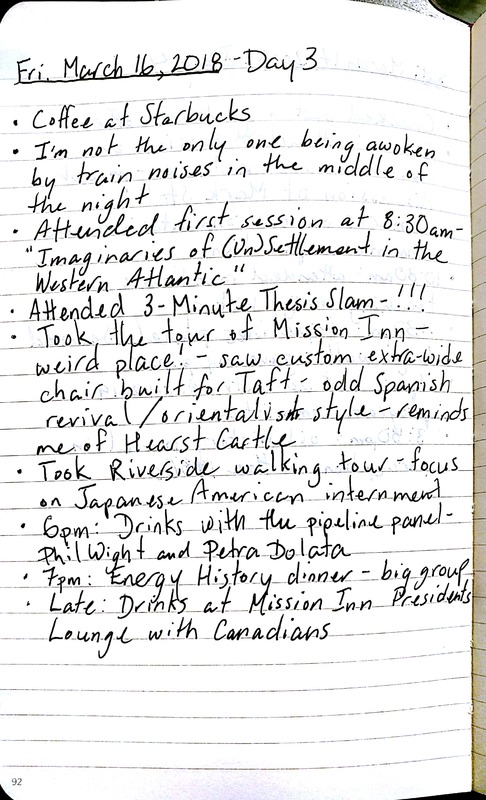 The notes above are daily summaries of what I did and saw at the conference and outside the conference. 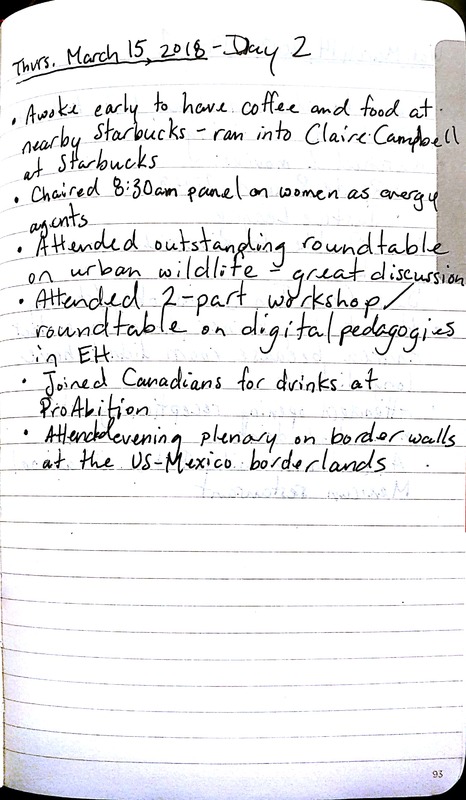 I kept more detailed notes on each paper I saw, the roundtables, and the workshops. In the absence of an internet-connected device, I certainly remained focused on everything I saw at the conference. I jotted down references, questions, and stray thoughts. I have plenty to follow up on now. Without access to the internet, however, I missed a lot too. My sense of the overall discussion at the conference was quite limited. I chatted with plenty of people, attended dinners, and drinks. I asked questions and listened to the discussions in each session I attended. I couldn’t see what people were saying in other sessions via Twitter. I couldn’t read others thoughts and remarks posted online. I couldn’t access the online resources referenced and shared during the panels. I couldn’t follow up on the websites for any of the posters. I almost couldn’t find the location of the opening reception. I gained some things by going offline for the conference (more focus, detailed notes, less concern about battery life and Wi-Fi reception), but I missed out on all the enhancements the internet has brought to academic conferences (cross-session discussion, broader dissemination of conference proceedings, resource sharing). Energy history continues to be an area of growth in environmental history research. I noted energy history as an emerging theme at the 2015 ASEH annual meeting and that trend has continued. I attended the energy history dinner for the first time and was told that the dinner used to be a small group of people who could sit around a table and get to know one another. This year was quite a large group that took up a good portion of the restaurant. I met several scholars working on energy history, but was not able to speak with everyone who was there. The field had grown enough this year to be able to have an entire panel just on energy pipelines. I also attended sessions on household-level energy histories, oil politics, and teaching energy history. Presentism isn’t a dirty word anymore. While this wasn’t the specific theme of any of the sessions I attended, the issue of “presentism” emerged on more than one. Several presenters discussed the advantages of presentism and its value in environmental history scholarship. They rejected the pejorative connotations of the term and instead called upon researchers to embrace the contemporary relevance of environmental history. Interesting. Conference diversity. I mean this in more ways than one. First, it is clear that the ASEH is aware of its limited racial and gender diversity and the association is taking steps to address diversity at the conference in a number of ways. Second, the internationalization of the conference continues. It seemed as though there were more panels on topics outside of the US. I also attended panels with more chronological depth, including early modern and medieval periods. Finally, there was also diversity in panel formats. I attended traditional 3-4 paper panels, rountable discussions, plenaries, workshops, and lightning sessions. One of the most interesting sessions was the 3-Minute Thesis Slam where graduate students had three minutes to present their dissertation topics and main findings. I also enjoyed the workshop session on digital pedagogies where I finally learned how to build a StoryMap. Like all good conferences, ASEH 2018 was intellectually rejuvenating. I learned about some exciting new research, explored the local history of Riverside on a walking tour, caught up with colleagues, and met a lot of new people. Conferencing offline had its advantages and disadvantages. I’ll probably do the same next year in Columbus for ASEH 2019, but I look forward to returning online for ASEH 2020 in Ottawa.